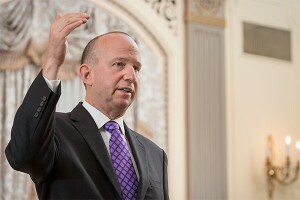 That vulnerability, Markell expects, will remain until leaders commit to educating young people on this topic as early as possible in school and with all stakeholders coming together to implement a plan of attack. To tackle how Delaware might best approach this challenge, CEE assembled panels of educators, policy makers, volunteers and sponsors to address the role of private and public partnerships in financial education; to explore how to bring programming to more districts across the state; and to determine how all can work together to support improved economic and financial literacy. Janet Bodnar, editor of Kiplinger’s Personal Finance, oversaw the panel discussions and fielded questions and comments from the audience. Leslie Kosek, a panelist and representative from Capital One, suggested that before people can expect such education to take root, they need first to lift the taboo of discussing money matters within their own families. “Until we can talk openly in our homes about earning pay checks, budgeting and saving, we cannot expect our children to learn how it’s handled,” said Kosek. The Panel speaking on Economic and Financial Education. Panelist and State Rep. Ruth Briggs King agreed, stating that personal finance cannot be equated with common sense. A former educator, Briggs King reported that Delaware ranks 38th out of 50 states in financial literacy. 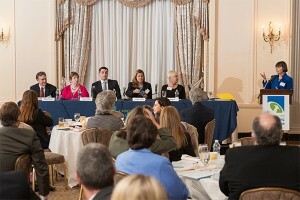 Ronni Cohen, executive director of the Delaware Financial Literacy Institute, believes that education need not wait until students reach secondary school, and noted preschool teachers can incorporate economic and personal finance lessons into the books that they are already using, while elementary school teachers can highlight related concepts in the math, science and history lessons they are already teaching. 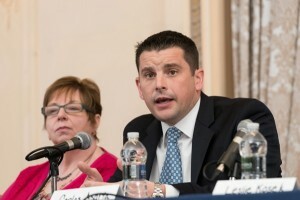 Carlos Asarta, director of CEEE, reminded assembled community members that the center is already effectively equipping K-12 teachers in personal finance curriculum and student programming, working to implement appropriate standards to align with these goals, and moving toward the goal of making these important lessons a staple ingredient in every student’s education. Using the analogy of Formula One racecars, Asarta illustrated that specialized, well-formulated CEEE programs likewise need visible and active sponsors to successfully move students across the finish line. With continued financial and in-kind support from partners like University of Delaware, local banks, like-minded organizations and individuals, Asarta expects the center to continue to offer more than 100 teacher training and student programs annually. Carlos Asarta, Director of University of Delware’s Center for Economic Education and Entrepreneurship. Becky Reed, Red Clay School District social studies superintendent, lauded CEEE for standing solidly behind economics and personal finance education, providing districts with the curriculum they need; methods on how material can be implemented in the classroom; means to accurately assess student progress; and ongoing professional development opportunities to keep teachers current..
“Without support from the center, I don’t know how economics and personal finance could be taught in Delaware’s K-12 schools,” said Reed. “Hands-on sticks, but more needs to be done to instill the ethic of saving in young people,” added Atiya Chase, Stubbs elementary School after-school program specialist. Attendee Diana Brown, New Castle County’s (NCC) community services manager, agreed. According to State Bank Commissioner Robert Glen, $1.5 million has been awarded to approximately 25 schools and non-profits over the last three years — CEEE among them — through his office’s Financial Literacy Education Fund. But while teacher interest and program funding are important, until personal finance is more formally written into state curriculum, schools will not have the incentive to implement such programs, said panelists. Nan Morrison, CEO of CEE, introduced statistics showing that, while all states have implemented standards that include economics, only 22 states require students to take an economics course as a high school graduation requirement. Further, while 17 states do require students take some form of personal finance coursework, only six require that testing of such student knowledge be conducted. In Delaware, just 10 high schools currently require such coursework. These schools use an intensive training program co-authored by CEEE and the Federal Reserve Bank of Philadelphia, “Keys to Financial Success”. 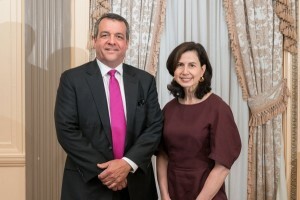 Capital One Executive Vice President Jim Kelly and CEE CEO & President Nan Morrison. “Among students using the ‘Keys’ curriculum, the data shows that significant improvement is being made,” reported Asarta. Attendee Kathy Floyd of the Consumer Financial Protection Bureau in Washington, D.C., asked how the federal government could help. Bonnie Meszaros, associate director of CEEE, said she would like to see state standards put in place and related testing conducted for personal finance — similar to what is already in place for economics. Andrew Hill, Federal Reserve Bank of Philadelphia economics education adviser, agreed and said advocacy in this regard is key. For Hill, centers like CEEE are essential to accomplishing this goal. 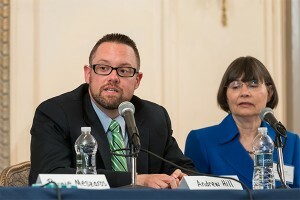 Federal Reserve Bank of Philadelphia Economics Education Adviser Andrew Hill. 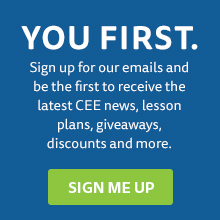 “The CEEE is truly the small wonder in economics and personal finance education, making huge strides and doing more than any one organization has ever done in this regard,” said Hill. “They do so because they realize that teacher training is the key. Panelist Preston (Dusty) Shockley, education associate with the Department of Education who received a master’s degree in economic education, said the real question is how the incentives awarded to schools and districts can change. “If positive test results influence funding, we need to pretest and posttest students to get schools on board,” said Shockley, adding that until as much focus is placed on personal finance as is on reading and writing assessments, substantial change is not imminent. Stephanie Messinger, a teacher at Charter School of Wilmington, encouraged parents and principals to be first adopters and assured fellow audience members that teachers are already on board.